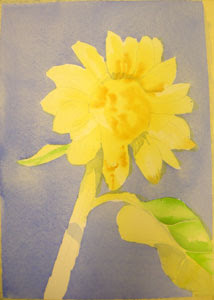 Today I am adding some Sap Green to the leaves of the sunflower. Again, I am working very wet, especially on the sunlit leaf on the upper left. I can use a stronger mixture of paint and water to create the rounded shapes on the leaf at the right because I will soften the edges here and there with clear water.